The is actually what I’m wearing now, I decided to take pictures for a post since my lecturer was not punctual( I hope he doesn’t read this because if he does, nah carry over be that) . 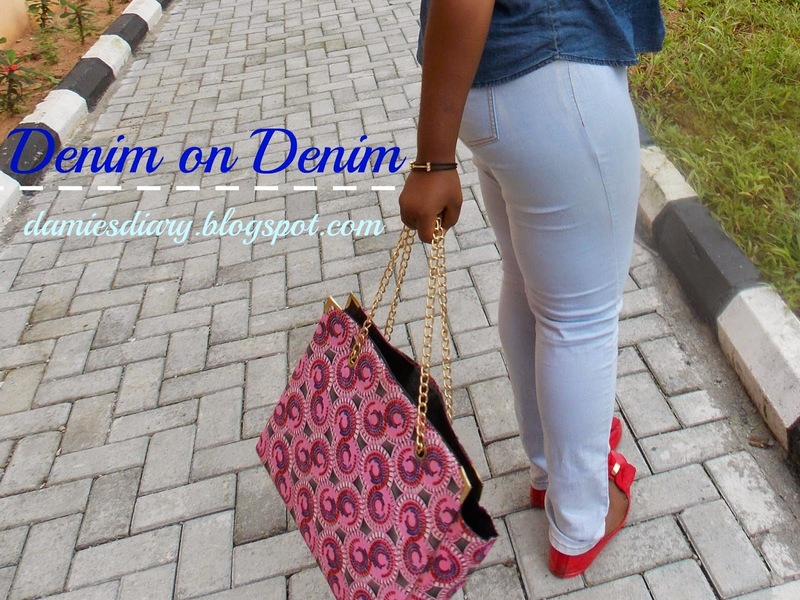 The denim on denim trend is something I have followed for a while and I have wanted to try this for a long time and finally I did. Would have loved this look with a pair of heels but its my basic class look so I opted for red flats and my hand-made ankara bag. To effectively rock this look I advise you use contrasting denim colours rather just like I did here or distressed or faded jeans. pairing the same colour of jeans might be boring. please subscribe to my relatively new YouTube channel, great new stuff coming up there soon trust me you do not want to miss it( winks). Also join the giveaway!!!!! currently running on the blog. Thanks for visiting, Love you!!! !